This is a substantial detached house built in the original Capistrano village. It has two bedrooms, one shower room, one bathroom and a guest w.c. in the main villa and a large double bedroom with ensuite shower room in a separate apartment underneath. It also has the added advantage of gas central heating. The light, airy lounge is of good size with comfortable seating and good quality furniture. The floor is beautifully tiled and there is a T V on satellite cable receiving many English channels. The dining area has a new light wood dining table and chairs and the fitted kitchen is directly off this area. It has pristine white wooden units, gas hob and electric oven, washing machine, fridge freezer and microwave. From the lounge there are French doors leading to a patio with plenty of tables and chairs, and steps leading to a private garden which is perfect for children to play in. As it is on two sides of the villa, there is sun and shade at every hour of the day. The downstairs w.c. is off the lounge and has a w.c. wash hand basin, large mirror and is beautifully tiled. Go upstairs to the first large twin bedroom which is very pleasantly furnished with fitted robes, drawers and a ceiling fan. The window overlooks the patio and affords views to the sea and mountains. The ensuite shower room has a shower cubicle, w.c. and wash hand basin. The main bathroom has a good size window giving it lots of light, a bath with shower over, vanity wash hand basin with large mirror, bidet and w.c.. 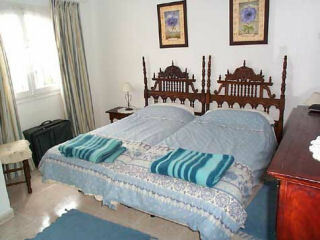 The second bedroom is again of very good size with twin beds, fitted robes, drawers and ceiling fan. The French windows lead to small ‘Juliette’ balcony. From the garden, there is the separate bedroom, which is very large and has twin beds, drawers, fitted robes and ceiling fan. The good size window allows in plenty of light. The ensuite shower room has shower cubicle, w.c. and wash hand basin. This room would easily take another bed should it be required. Capistrano village is a beautiful holiday urbanisation on the east side of Nerja with two large communal pools, mini supermarket, restaurant, two bars, laundrette. There are many enjoyable walkways always enhanced by a profusion of pretty colourful flowers and green shrubs. 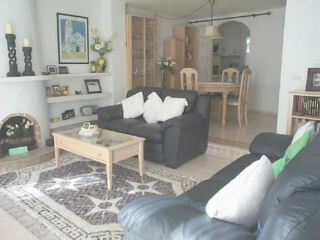 It is approximately 20 minutes walk to the town and beach, or 5 minutes by car. There is a supermarket about 5 minutes walk away.